String verticals every 12 in. Posts (built-in) every 12.5 ft., .75" dia. Deer have a high internal resistance. So use an energizer that produces a strong, high output, high voltage pulse. Make sure the fence is always properly energized. 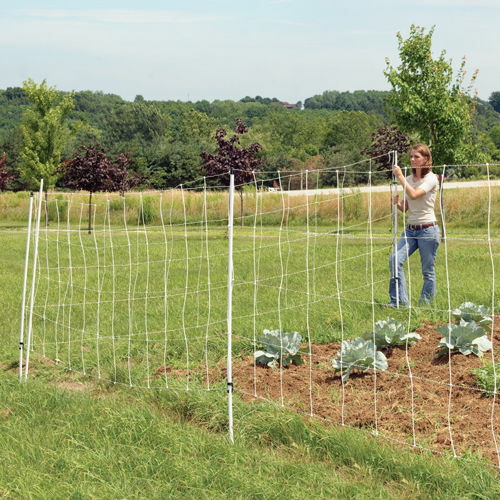 Setting up the fence and installing the energizer a day or so later may seriously reduce its effectiveness. Bait the fence so deer are encouraged to touch the fence and thus receive a painful, memorable shock. If using a solar energizer, make sure it is facing due south—to take advantage of the most available sunlight. Never set the energizer in the shade. Note: Deer, like goats, have high internal resistance because they have long thin legs, their hair is hollow, and their hooves are hard and dry. So it’s wise to use a “wide-impedance” fence energizer that is specifically designed for high resistance animals. Measure the proposed fence line. Calculate feet of net that needed. 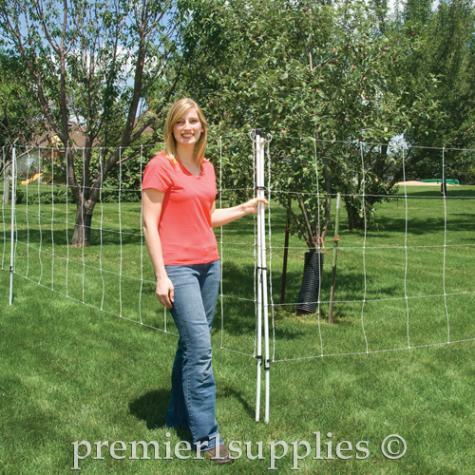 Example: A 200 ft fence line requires two 100 ft nets. Count up the support posts for corners or ends. 6 ft steel T posts are advised though 6 ft 11/16" FiberRods also work. Both are available from Premier.